I feel it is very important to regularly exercise our 1,247 amendment, 'a person's right to mist'. Whether at work, at home, or reading blog posts, you should mist freely and openly because you CAN. And because your skin needs it (and because it feels amazing but that sounds a tad more selfish, so go with aforementioned reasons first). I like to keep a bevy of mists around me at all times because who knows when the mood will strike for a blast of hydration. Variety is the spice of life, and the spice of beauty products, yes? 1. Boots No. 7 Mineral Water Spray - This looks like water. This feels like water. Yet it is packed with minerals to help hydrate the skin in a flash. This is a no muss, no fuss mist at a wonderful price point, that frankly can be bought in bulk for every place you feel the need to stash one. 2. Tatcha Luminous Dewy Skin Mist (c/o) - This is decadence in a mist format. From the way the bottle looks, to the efficacious formulation, to the actual manner in which the product is dispensed from the bottle, I feel fancy every time I use this. While most mists come out in a strong spurt, or in an uneven distribution leaving one part of your face more damp than the other, this milky emulsion has a fine and delicate delivery system that feels more like a luxe spa treatment than a hand held mist. Pinkies out when using this gem. 3. Murad Hydrating Toner - This is truly a toner designed to hydrate and help balance out the pH of the skin, but still makes it into my list of mist loves. The spray is a tad strong so it is best used at home after your cleansing routine, but no doubt this is a winner at replenishing and rebalancing the skin. I use it both morning and night after I have cleansed and used an exfoliating toner - my skin is them primed and ready for a blast of hydration. And I blast away. A few times at that. It's my right, remember? 4. 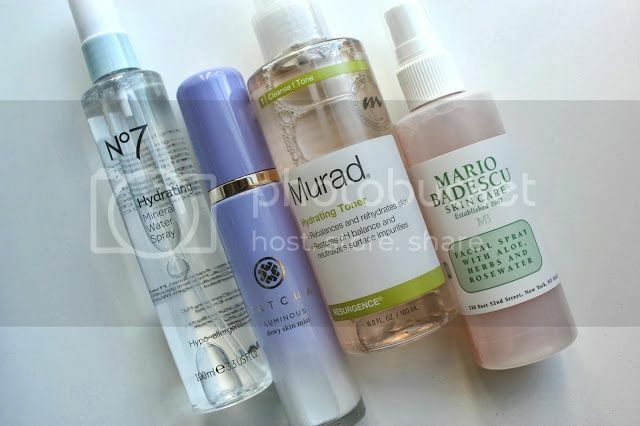 Mario Badescu Facial Spray with Aloe, Herbs and Rosewater - How do I love thee Mario Badescu? Let me count the ways. Just the name of this product alone suggests calm, peace and relaxed skin - and it delivers just that. Perfect as a toner, or as an on-the-go boost when you need it, this spray is suitable for all skin types and immediately gets to work to address any redness, irritation or dryness. Such a hard working little mist this one - it's only right that I give it the proper acknowledgement and praise.